The focus of the event will be on Windows 10 hardware where the Surface Pro 4 and Lumia 950/950XL smartphones are expected to make appearances. 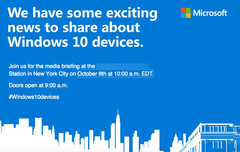 Microsoft has invited press and analysts to a Windows 10 event to take place on October 6 at 10 AM EDT in NYC. 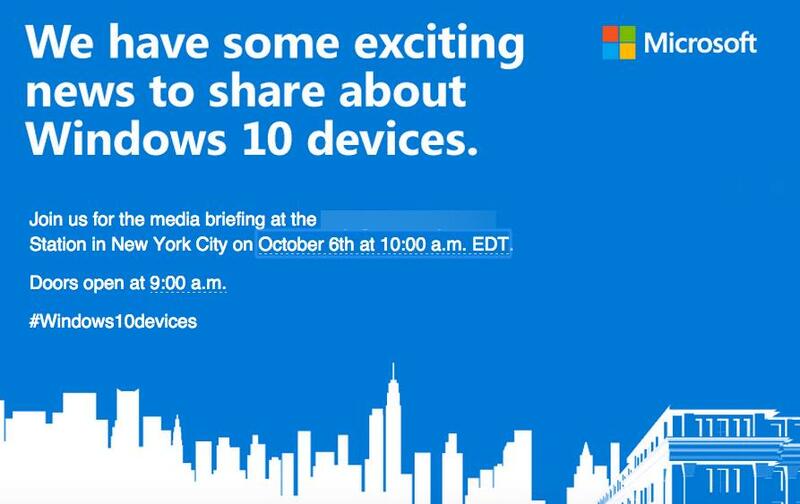 The invitation states: "We have some exciting news to share about Windows 10 devices" with the hashtag #Windows10devices. Users can also check out the live event online or through Xbox Live at Microsoft.com/october2015event. It is very likely that the event will feature brand new Windows 10 hardware, including the rumored Surface Pro 4 with Intel Skylake Core ix processors and the Lumia 950 (Talkman) and 950 XL (Cityman) smartphones. The Surface Pro 3 launched earlier last year and was very well-received. Major criticisms, however, included throttling issues, an active fan, and higher temperatures than users were expecting. Nonetheless, it currently holds first place in our Top 10 list of Windows tablets. Existing rumors on the Lumia 950 and 950 XL have been well-documented, though the Surface Pro 4 remains a larger mystery. More recent rumors claim that Microsoft will also reveal an Xbox One Mini during the event to take advantage of the Holiday season, but head of Xbox President Phil Spencer has outright denied such a claim.